Another Friday and another campground! 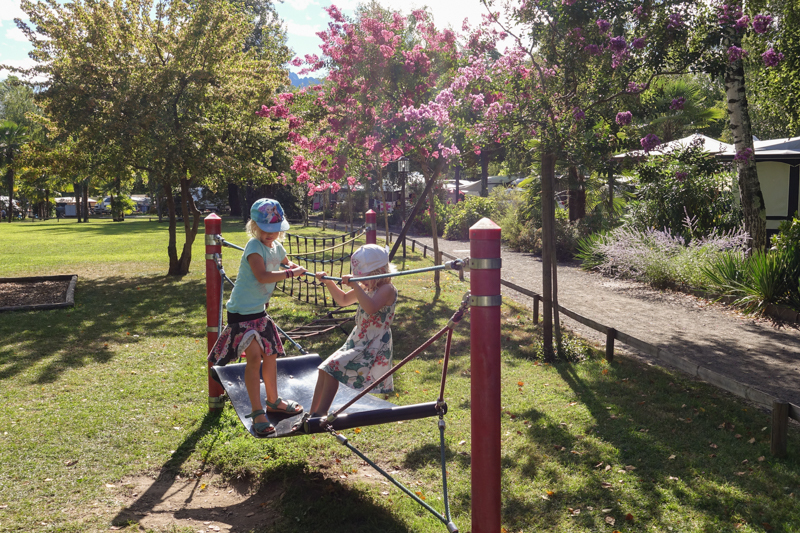 Camping grounds are a great way to spend holidays with kids. No worrying them being too loud. Lots of space for them to run around and ride their bikes. And lots of new kids to make friends with and play till the sun goes down. It jut makes holidays all that more simple, and today’s contributor thinks so too. Today we head south, to the sunny Kanton in Switzerland, Ticino, with Candaian-French Family of 5. Jan is a librarian and along with her scientist husband and 3 daughters (aged 2,4 and 7) have called Switzerland home for the past 6 years. They visited Camping Delta in Locarno last summer and reached out to SFT to share their experiences with us. 1. Tell us about your campsite and the best way to get there. 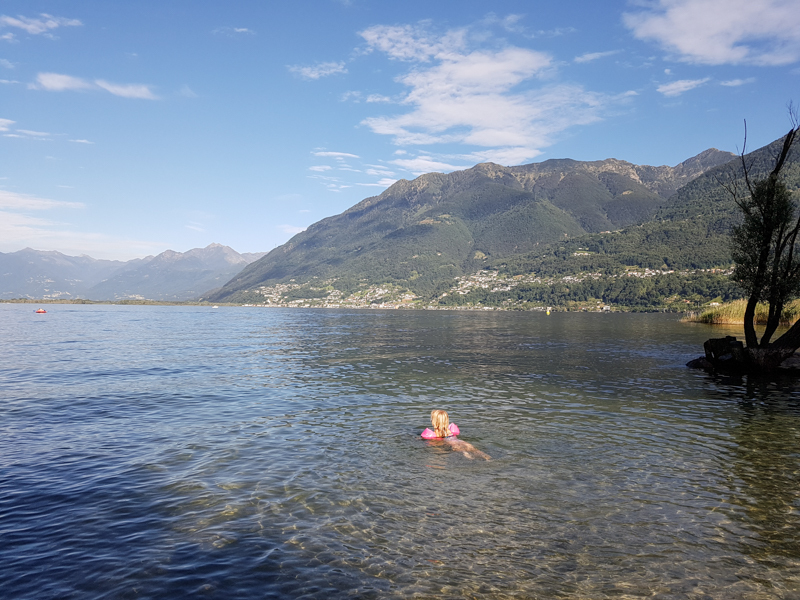 Camping Delta is in the Ticino canton, between Locarno and Ascona. The campground is on Lago Maggiore, and, more specifically, on the Maggia river delta (hence it's name). 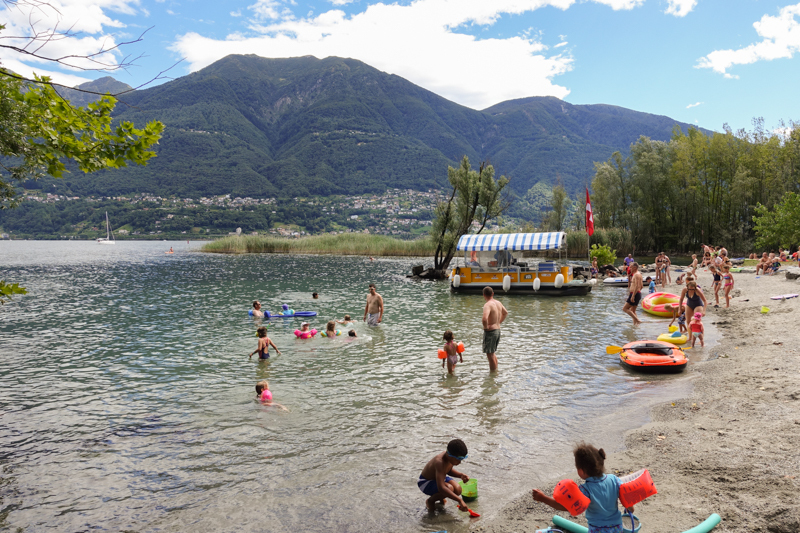 Since the campground is just outside of Locarno, it’s easily accessible by train and city bus. The campground has A and B sites. The A sites are better located (close to the water or the open spaces of the campground) and may be larger. Most sites are quite small, though there didn't seem to be a distinction between tent and trailer sites. Electricity costs 5chf per day, if desired. For those of you who don’t own camping equipment, the campground does have a small number of caravans for rent. 3. What facilities does the campsite offer? There is a huge bathroom complex that is kept very clean, and the showers are free. I don't recall seeing any cooking facilities, but there is a dishwashing station and a laundry room. There is also a well-stocked grocery store and restaurant at the entrance to the campground. 4. What activities does the campsite offer? The campground is right on the lake so there is a beach but no pool directly on the grounds, but there is a pool next door (see below). There are two playgrounds. One is at the restaurant and only accessible when the restaurant is open. In the summer, a children's program is offered on certain days of the week, though we didn’t use it (I believe the activities are offered in German). There is also an arcade that we didn't use. We had a camp stove and mostly cooked our own food. The on-site grocery store is well-stocked but expensive. We shopped there periodically (they have excellent pastries delivered fresh each morning), but when we needed to restock we went to a grocery store in nearby Locarno. We had pizza at the restaurant a couple of times. There were so many things to see and do! The campground is located right next to Lido Locarno, a huge pool/beach complex. Both Ascona and Locarno are worth a visit. 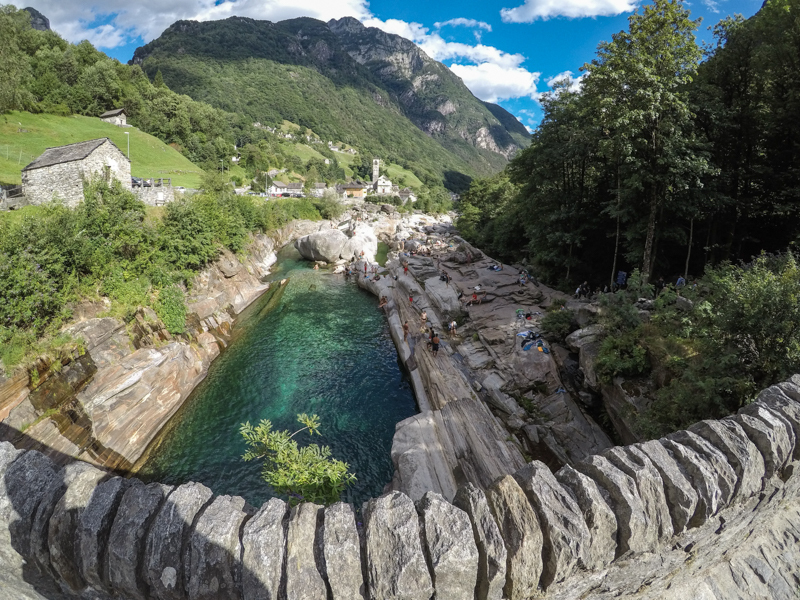 We also visited both of the nearby river valleys, Valle Maggia and Valle Verzasca. Verzasca is a bit further but the kids really enjoyed it, especially the village of Lavertezzo. Bikes! There are bike paths departing from the campground in all directions. We biked to Ascona, Locarno, the Valle Maggia and beyond. We spent two days exploring the river valleys by car, but otherwise we biked. We booked through the campground’s website. We only booked about a month in advance, but we didn't see an empty spot while we were there so I’d recommend booking earlier, especially for the summer months. There is a reservation fee of 50chf. I will warn you that the campground is quite expensive. Kids under 12 stay free, but nevertheless with the reservation fee taken into account we paid about 70chf per night. The sites are very small and close together, even by European standards. At the time we still had two smallish tents, while one big tent would have allowed us better use of the space. There are trees at the corner of all the sites, most of which are large and mature. Our tree had recently been replanted and was quite small, so the site was hot and sunny by midday and through the afternoon. It would be best to bring an umbrella or two just in case. The lakeside location. The lake, the mountains, the lush vegetation, the river delta, the bike paths, the gorgeous sunny weather -- it was like a dream and might be the best family trip we've ever done (it ranked among the top 3, for sure). We'd actually intended to book a spot at a well-known and popular campground in the Valle Maggia, but missed the reservation period. I don't think we would have enjoyed our stay nearly as much had we not been on the lake shore so it was good luck that it ended up as it did. We are a family of five. I (the mom) am Canadian and grew up camping in Canada’s national and provincial parks. We only recently started camping with our kids and have stuck with tents so far. While I miss the nature and privacy of Canadian campgrounds, I'm beginning to appreciate the many services offered in European campgrounds, which simplify camping with kids. A big thanks to Jan for sharing all about Camping Delta in Locarno. If you have a campground that hasn’t yet been featured, get in touch just like Jan did! Don’t be shy! Let’s Go Camping is a seasonal series here on Simple Family Travel. 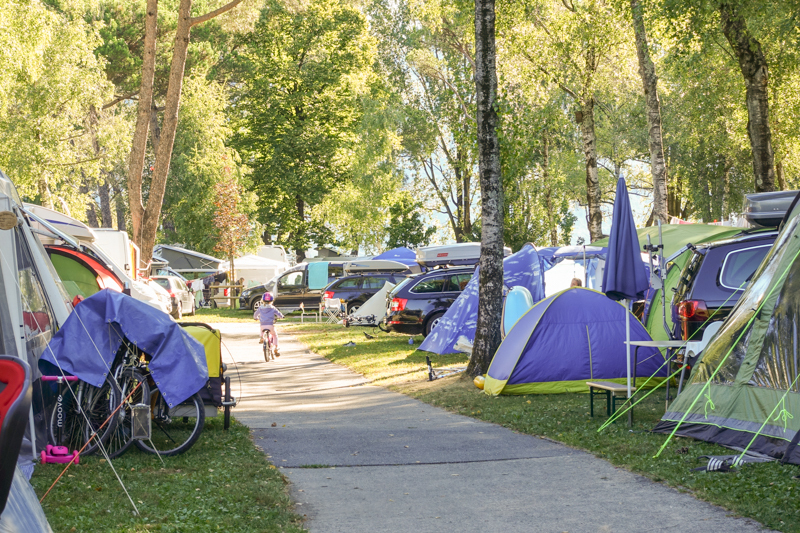 From March till May we will discover campgrounds in and around Switzerland, all which come recommended from families who have actually been there. Discover the best way to get there, where to eat, what to do and what to watch out for.